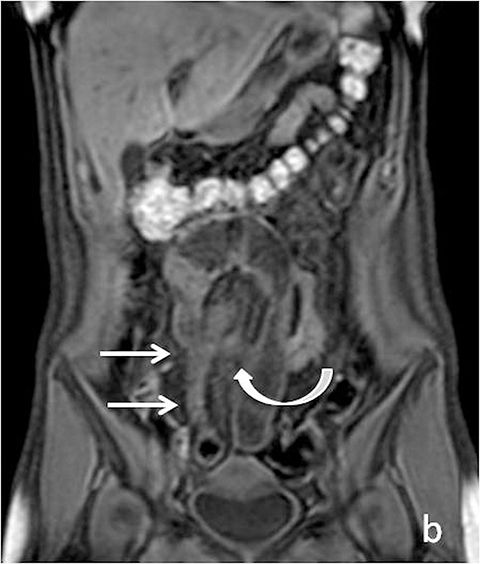 With recent advances in magnetic resonance imaging (MRI) software and hardware, and increasing expertise among technologists and radiologists, MR techniques have come to the forefront of imaging patients with known or suspected bowel pathology in both emergent and outpatient settings. 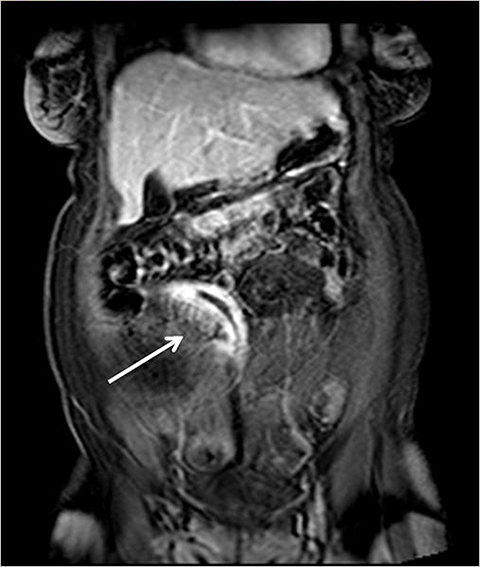 MRI provides a number of advantages over more conventional techniques for imaging the small bowel. Superior tissue contrast and lack of ionizing radiation are its major advantages over computed tomography (CT) and contrast-enhanced fluoroscopy. 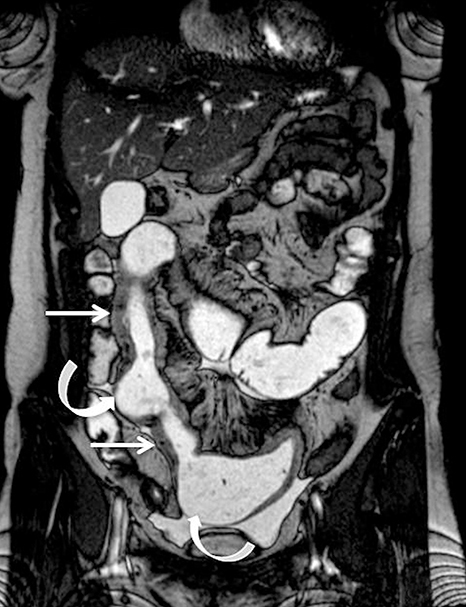 Furthermore, with its dynamic sequences, MRI permits assessment of functional information and improved visualization of the entire bowel.1, 2 Lastly, MR imaging may also be used for patients with contraindications to contrast-enhanced CT imaging, including those who are pregnant and those with allergies or contraindications to iodinated contrast. MRI techniques available to evaluate the small bowel include MR enterography (MRE) and MR enteroclysis. In MR enteroclysis, enteric contrast is administered directly via a nasoenteric tube, providing superior distention of small-bowel loops compared to oral ingestion in MR enterography. However, MR enteroclysis remains of limited availability, perhaps due in part to patient discomfort, and at least partially because such distention may not be necessary to evaluate for a number of pathologic processes that may affect the small bowel. As a result, this review will focus primarily on MR enterography. New applications for MRE have come to the forefront. 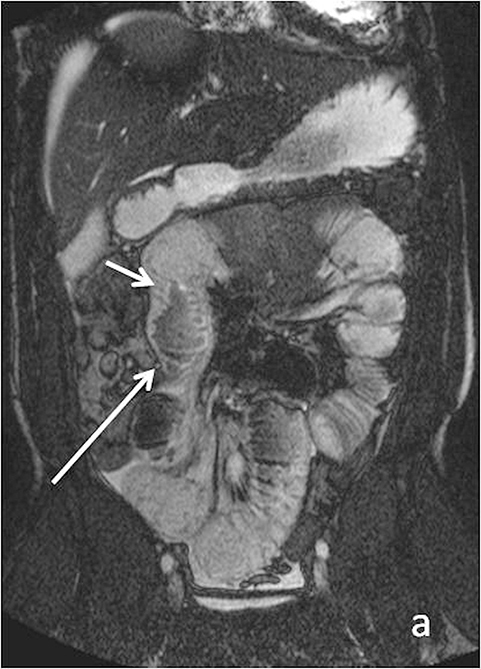 For example, a number of authors in the radiology literature have described MRI in characterizing Celiac disease.1 Imaging findings such as reversal of the jejunoileal fold pattern, which have classically been described on conventional barium fluoroscopic studies, can be well visualized at MRE. Associated findings, such as small bowel intussusception, mesenteric lymphadenopathy, and possible associated Celiac disease-related lymphoma, are also readily identifiable. MR enterography may also aid in evaluation of small bowel obstruction, especially in patients in whom it is desirable to avoid radiation exposure (children/young adults or pregnant patients). MR enterography typically requires administration of a high volume of oral contrast material, usually on the order of 1500 to 2000 mL, to be ingested during the 2 hours preceding the examination. A number of enteric contrast agents may be used for MR imaging. These can be broadly classified into 3 major types: negative, positive, and “biphasic” contrast.11 The majority of commercially available enteric contrasts are biphasic. Biphasic contrasts demonstrate different signal intensities on T1- and T2-weighted imaging. Specifically, on T1-weighted imaging these agents demonstrate low signal intensity, thus allowing for improved contrast between bowel lumen and bowel wall, and improving detection of pathologic wall hyper-enhancement. On T2-weighted imaging, these contrast agents are high in signal intensity, allowing for delineation between the lumen and the dark bowel wall. There are a variety of commercially available enteric agents, with the preferred agent in our institution being barium sulfate (VoLumen; E-Z-Em/Bracco, Lake Success, NY). The intrinsic advantage of VoLumen is that it contains sorbitol, and thus acts as an osmotic agent, promoting luminal water retention1. Negative contrast agents have low signal intensity on T1- and T2-weighted imaging, and include superparamagnetic particles. On T2-weighted images this provides the benefit of improved visualization of mural inflammatory high signal. This also allows for increased recognition and detection of interloop abscesses.2 An example of a negative contrast agent is ferumoxsil oral suspension. Unlike negative oral suspensions, positive enteric contrast agents are paramagnetic substances, which produce high signal intensity on both T1- and T2-weighted sequences. Although this may have the advantage of demonstrating bowel wall thickening on T1-weighted images, the drawback is potential masking of mural enhancement abnormalities. 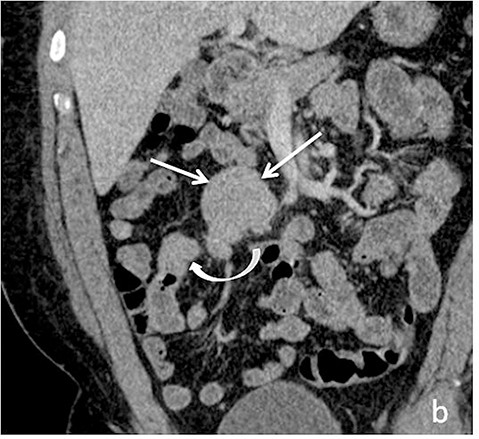 With administration of IV contrast, pathologic findings such as hyperenhancement of the bowel wall or enhancing mural/endoluminal mass lesions can be made more conspicuous.13 Intravenous contrast is not absolutely crucial to localizing small bowel pathology, as the excellent soft-tissue contrast resolution of MRI may be sufficient to delineate the small bowel abnormality. This may be especially useful in patients with contraindications to gadolinium-based contrast agents, such as patients with severe renal failure or those who are pregnant (Figure 2). However, in patients with Crohn’s disease, although regions of bowel wall thickening, stricturing, and mural edema may be detected without gadolinium chelates, some of the earliest signs of active disease such as mucosal hyperenhancement may be missed. Complications in Crohn’s disease, including abscess or fistula formation, are also made more conspicuous on post-gadolinium imaging. Although there is no single universal protocol for optimal imaging of small bowel, it is generally accepted that T2-weighted and multi-phasic contrast-enhanced gradient-echo sequences are particularly useful. Specifically, we find single-shot half-Fourier T2-weighted turbo spin-echo sequences (SSFSE, SSTSE, or HASTE, depending on vendor) to be helpful, especially with biphasic oral contrast, as they provide superb spatial resolution, good T2-weighting, and fast scan times.14 These sequences can be used to obtain an overview of the entire bowel and to localize pathology.15 One drawback of these sequences, however, as mentioned previously can be dark signal voids in fluid-filled bowel due to peristalsis, especially if spasmolytics are not used (Figure 3). To counteract the problem of bowel signal voids, balanced steady-state free precession sequences (FIESTA, balanced FFE, depending on the vendor) can be useful adjuncts as they have very rapid acquisition times, and also can be used to create cine loops which can depict bowel motility.15 Lastly, we obtain coronal T1-weighted dynamic, 3D fat-suppressed gradient echo sequences with and without gadolinium, to evaluate for regions of inflammation, peri-enteric complications, and possible regions of bowel stricture. Image subtraction sets may be created for each of the post-contrast phases (eg, arterial, venous or equilibrium), with areas of enhancement better delineated by the high signal remaining after the digital subtraction of the pre-contrast sequence from a post-contrast sequence. Subtraction images are useful for identifying equivocal enhancement, or for further characterizing known regions of abnormal enhancement. Identifying active inflammation is imperative for guiding clinical management algorithms for Crohn’s disease. While active disease may be treated medically with systemic steroids or immunomodulators, chronic disease may require surgery.17 Therefore, discerning active flare from chronic fibrostenotic disease is essential. Subtle mucosal hyperenhancement can be one of the earliest signs of active Crohn’s flare (Figure 4). In more severe active inflammation, small bowel may demonstrate classic “stratified” appearance, as a result of submucosal edema. Serosal hyperenhancement may also be seen. Perienteric and interloop abscesses may form, but may be difficult to detect on MR, and thorough investigation of bowel loops and the mesentery in all available planes should be undertaken. Negative enteric contrast may be especially beneficial in recognition of interloop abscesses, which may otherwise be masked by retracted, matted loops. 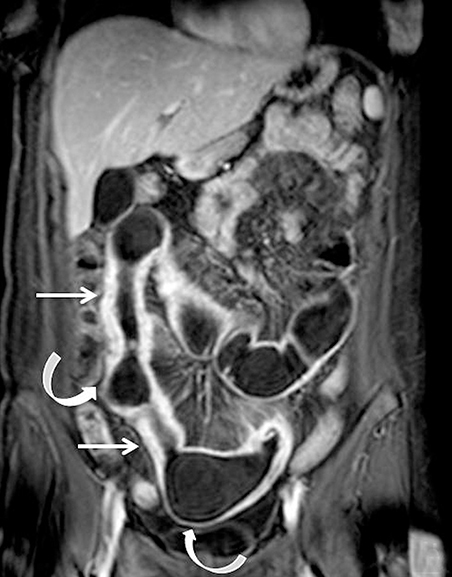 Superior soft-tissue contrast of MRI in conjunction with presence of enteric contrast for bowel distention has proven to be useful in evaluation for small bowel lesions (Figure 10). This is especially pertinent for patients with polyposis syndromes. Biphasic enteric contrast helps increase the conspicuity of mass lesions. 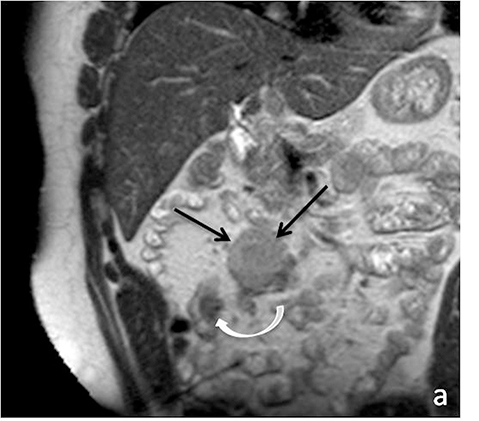 Small bowel lesions demonstrate variable enhancement on post-gadolinium imaging. They are frequently also relatively lower in T2 signal intensity as compared to surrounding luminal fluid, but caution must be taken not to rely solely on these sequences, as luminal flow voids related to peristalsis my mask these lesions. A variety of neoplastic and benign lesions can be found in the small bowel, each exhibiting variable imaging characteristics. 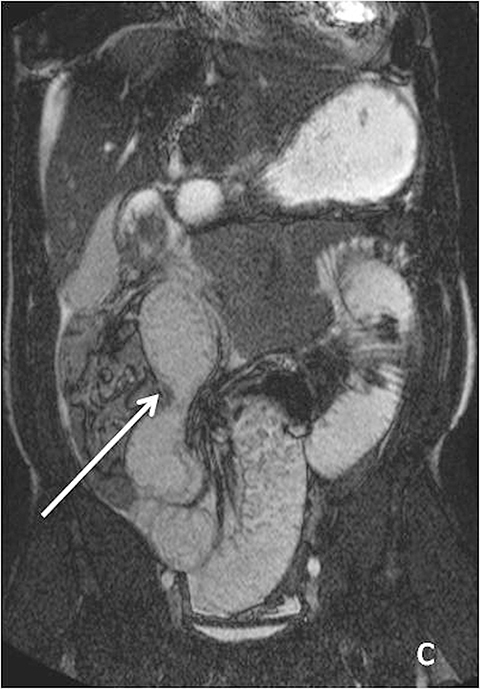 Benign lesions such as lipomas can readily be characterized with MR given the hyperintense signal on T1-weighted imaging and loss of this high signal with fat-suppression techniques. 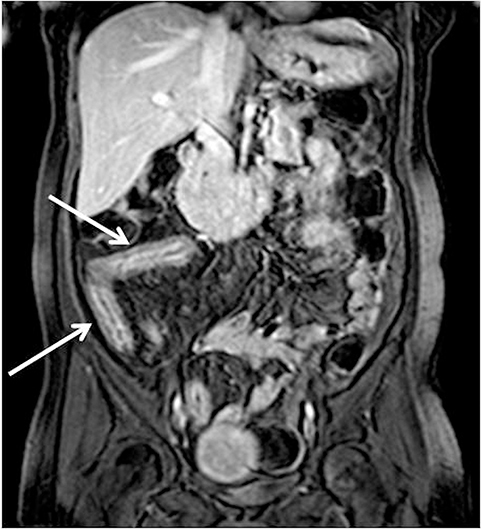 Small bowel hemangiomas classically demonstrate high signal intensity on T2-weighted imaging. 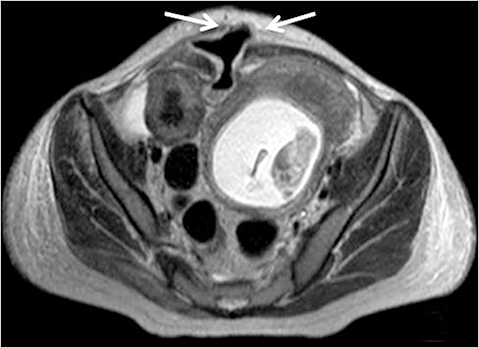 Adenomas, which are the most common asymptomatic benign tumor of the small bowel, can present as a pedunculated or sessile soft tissue mass, with moderate homogeneous enhancement (Figure 11).21 Malignant tumors such as primary adenocarcinomas and carcinoid tumors, may also be encountered at MRI. Over the last decade the use of MR techniques in evaluating small bowel pathology has expanded greatly, and this continues to evolve as more versatile uses are being recognized. 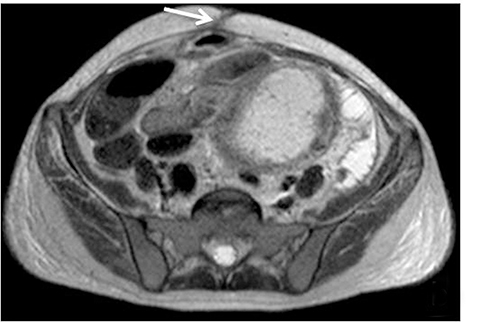 At this time MRE plays a critical role in surveillance of patients with established Crohn’s disease and in follow up after medical treatment, sparing patients repeat radiation exposure, which is inherent in CT imaging. Additional applications of MRE include evaluation of small bowel benign and neoplastic lesions, and evaluation of non-inflammatory small bowel entities such as Celiac disease. Additional applications are sure to come as MR techniques continue to advance. Masselli G, Gualdi G. MR imaging of the small bowel. Radiology. 2012;264(2):333-348. Fidler JL, Guimaraes L, Einstein DM. MR imaging of the small bowel. Radiographics. 2009;29(6):1811-1825. Kim DH, Carucci LR, Baker ME. Crohn’s Disease. ACR Appropriateness Criteria 2014. American College of Radiology Web site. http://www.acr.org/. Yaghmai V, Rosen MP, Lalani T, et al. ACR Appropriateness Criteria 2012. American College of Radiology Web site. http://www.acr.org/. Katz DS, Baker ME, Rosen MP, et al. ACR Appropriateness Criteria 2013. American College of Radiology Web site. http://www.acr.org/. Horsthuis K, Bipat S, Bennink RJ, et al.. Inflammatory bowel disease diagnosed with US, MR, scintigraphy, and CT: meta-analysis of prospective studies. Radiology. 2008 ;247(1):64-79. Schreyer AG, Seitz J, Feuerbach S, et al. 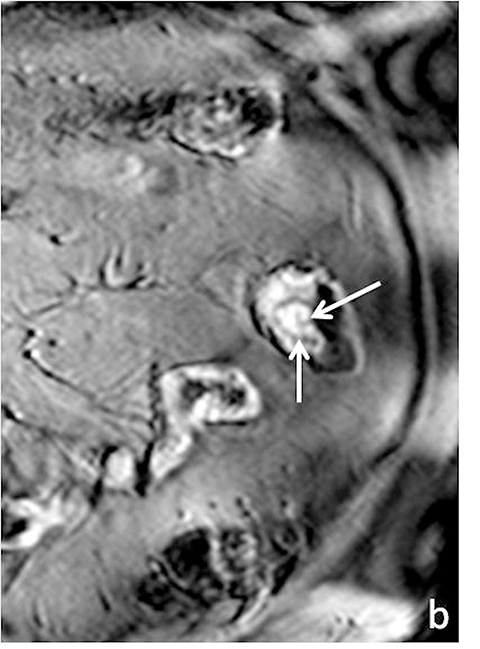 Modern imaging using computer tomography and magnetic resonance imaging for inflammatory bowel disease (IBD) AU1. Inflamm Bowel Dis. 2004;10(1):45-54. Arif-Tiwari H, Kalb B, Chundru S, et al. 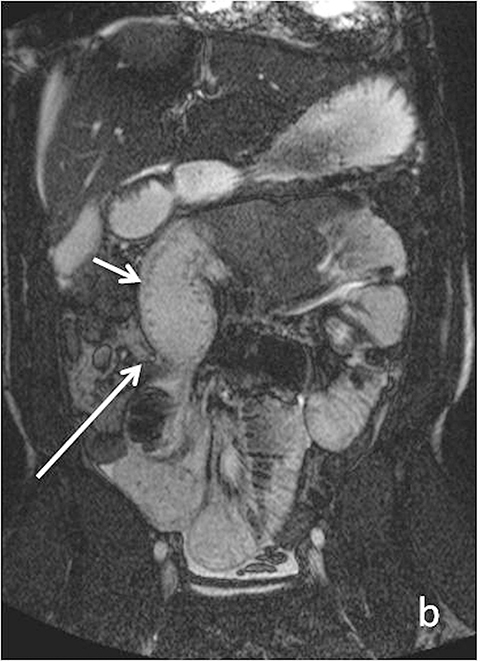 The diagnostic role of magnetic resonance enterography in Crohn’s disease: An updated review of techniques, interpretation, and application. Appl Radiol. 2013;42(12):5-15. Caspari R, von Falkenhausen M, Krautmacher C, et al. Comparison of capsule endoscopy and magnetic resonance imaging for the detection of polyps of the small intestine in patients with familial adenomatous polyposis or with Peutz-Jeghers’ syndrome. Endoscopy. 2004;36(12):1054-1059. Amzallag-Bellenger E, Soyer P, Barbe C, et al. Prospective evaluation of magnetic resonance enterography for the detection of mesenteric small bowel tumours. Eur Radiol. 2013;23(7):1901-1910. Laghi A, Paolantonio P, Iafrate F, et al. 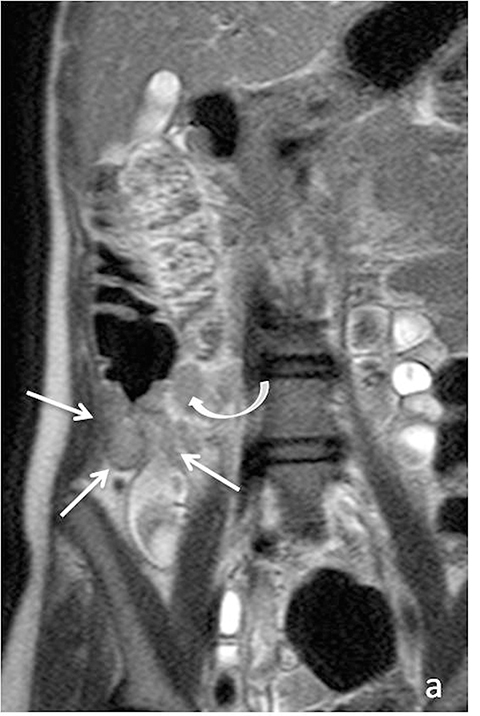 MR of the small bowel with a biphasic oral contrast agent (polyethylene glycol): technical aspects and findings in patients affected by Crohn’s disease. Radiol Med. 2003;106(1-2):18-27. Grand DJ, Beland M, Harris A. Magnetic resonance enterography. Radiol Clin N Am. 2013;(51): 99-112. Pupillo VA, Di Cesare E, Frieri G, et al. 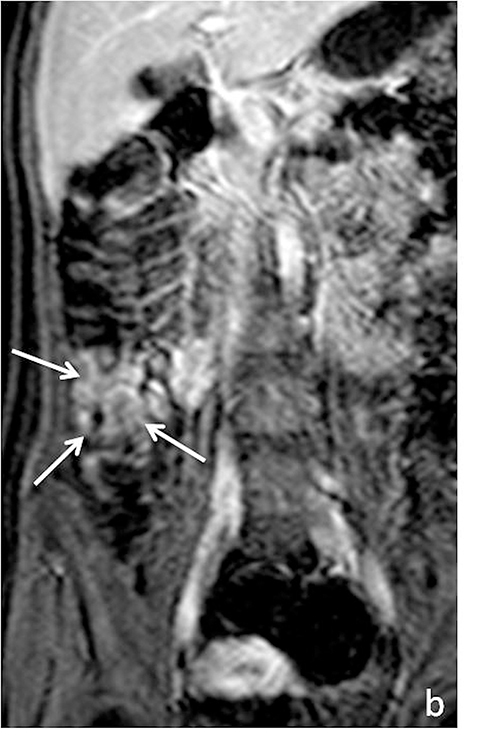 Assessment of inflammatory activity in Crohn’s disease by means of dynamic contrast-enhanced MRI. Radiol Med. 2007;112(6):798-809. Lebedis CA, Penn DR, Broder JC, et al. Current applications of MRI in emergent gastrointestinal disease. Appl Radiol. 2012;41(11):9-15. Leyendecker JR, Bloomfeld RS, DiSantis DJ, et al. 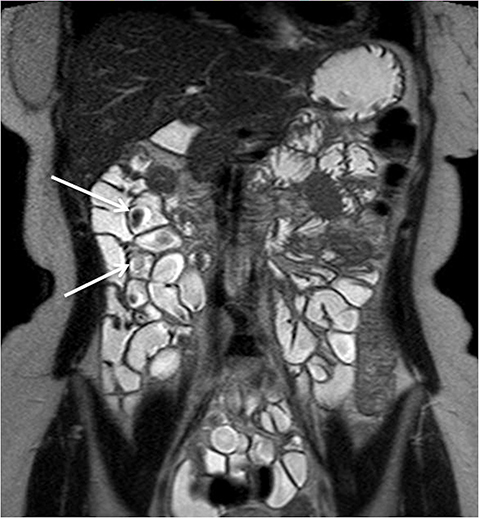 MR enterography in the management of patients with Crohn’s disease. Radiographics. 2009;29(6):1827-1846. Tolan DJ, Greenhalgh R, Zealley IA, et al. 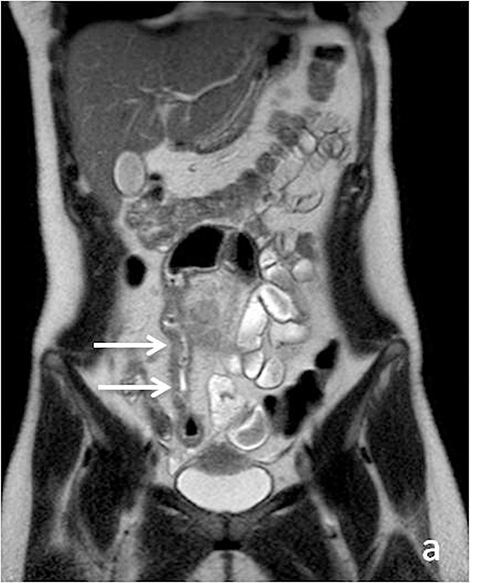 MR enterographic manifestations of small bowel Crohn’s disease. Radiographics. 2010;30(2):367-384. Lauenstein TC. MRI of inflammatory bowel disease. Appl. Radiol. 2008;37(7):19-24. Sinha R, Trivedi D, Murphy PD, et al. Small-intestinal length measurement on MR enterography: comparison with in vivo surgical measurement. AJR Am J Roentgenol. 2014;203(3):W274-9. Schmidt S, Chevallier P, Bessoud B, et al. 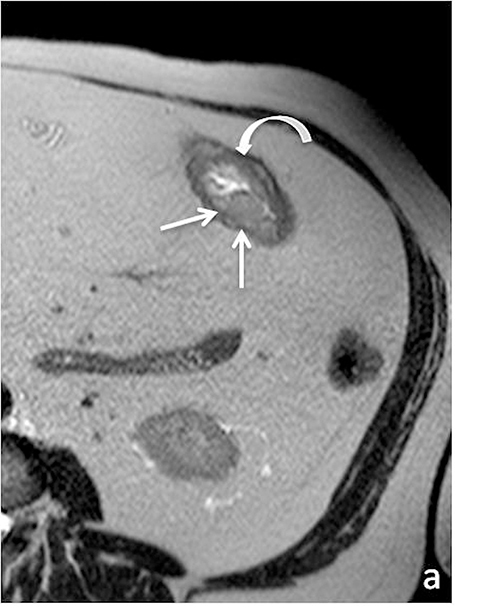 Diagnostic performance of MRI for detection of intestinal fistulas in patients with complicated inflammatory bowel conditions. Eur Radiol. 2007;17(11):2957-2963. Fallis SA, Murphy P, Sinha R, et al. 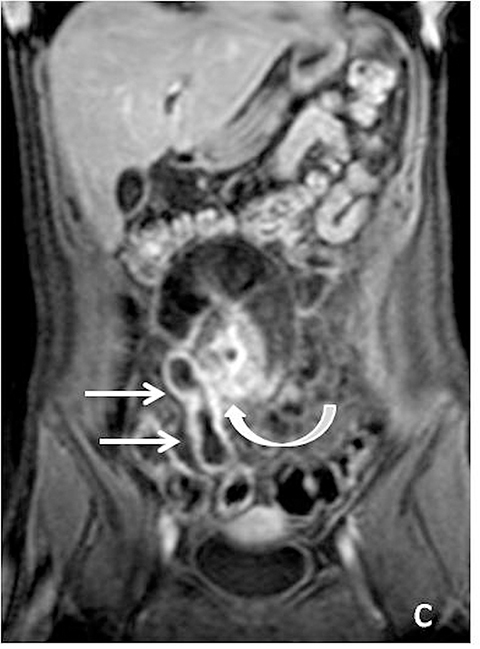 Magnetic resonance enterography in Crohn’s disease: a comparison with the findings at surgery. Colorectal Dis. 2013;15(10):1273-1280. Amzallag-Bellenger E, Oudjit A, Ruiz A, et al. Effectiveness of MR enterography for the assessment of small-bowel diseases beyond Crohn’s disease. Radiographics. 2012;32(5):1423-1444. Lohan DG, Alhajeri AN, Cronin CG, et al. 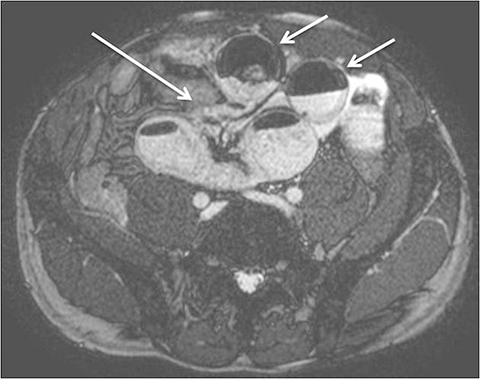 MR enterography of small-bowel lymphoma: potential for suggestion of histologic subtype and the presence of underlying celiac disease. AJR Am J Roentgenol. 2008;190(2):287-293. Melamud K, Colip C, Soto JA. MR in the small bowel: Applications, techniques, and imaging findings. Appl Radiol. 2016;45(6):24-20. Dr. Melamud is a fellow in abdominal imaging PGY6 at the Hospital of the University of Pennsylvania, Dr. Colip is a radiology resident PGY3, and Dr. Soto is a Professor at Boston University Medical Center, Boston, MA.